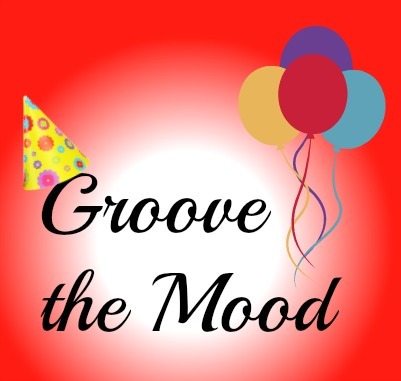 It is a brand-new section and we are calling it "Groove the Mood"! What's in it for you? A simple and easy way to create a unique party atmosphere with our one-of-a-kind party designs. With our pack of party printables all you have to do is Download, Print, Cut and Decorate. Yep, all you need to party is the right attitude (and delicious food). Kids love to party - birthday parties, Christmas party, Thanksgiving party, Halloween party, Mother's day party...just about every occasion is a moment to celebrate. Parties are a great way to get together with friends, relax and enjoy or get creative. Every hostess wishes to throw a party no one will ever forget. And the party really begins with the Invitations. The party invitation not only gives the receiver the good feeling of being included in your celebration, it also hints at the theme of the party. So your invitation should be as unique as your party is going to be. Back it up with decorations that go with the theme with matching color scheme, party decorations and (not to forget), the party favors. Personalize it with your child's name and Voila! your one-of-a-kind party is all set to 'Groove the Mood'. 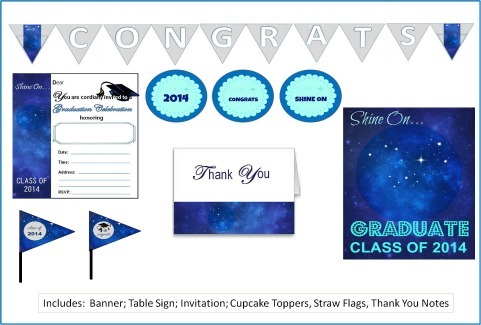 We kick off the event with our very first party pack including banner, cupcake toppers, flags, thank you notes and of course the party invitation printable and ready to use. And what better theme to start with but Graduation?! We would love to hear back from you. As this section has been created specially for you, we rely on your feedback to create more themes and better designs so your party can 'Groove the Mood'. We will keep adding new themes here. We will send out a shout through our newsletter every time we create a new design. So be sure to sign in and stay on top of it.